The fundamental challenge of college is the use of your limited resources. You want to use that time and energy in the best way possible to maximize your grades and understanding. A big part of this is how you study different sets of information. In some classes you might want to use flashcards to learn. In other classes, flashcards will just waste your time and energy. The first thing you need to figure out when deciding how to study is which category the information you need to learn fits best. This allows you to pick the best approach to getting the information to stick. Process Oriented study material requires virtually no memorization. You need to understand how to follow a process to reach a conclusion. When you know how to follow the process, you can totally forget everything else about the subject and still do well. For simplicity, I’m going to go over some common class examples of this but… this isn’t a sure thing. There are plenty of exceptions to the specifics I’m going to be going over. You’re going to need to verify it makes sense with the classes and teachers you have. Math is the most common example of a process oriented class. There is virtually no memorization when you understand mathematics. There may be one or two equations that you can memorize but it’s not required. Most of these equations can be figured out when you understand the processes that derive them. For a simple example, how do you measure speed? Speed is how much distance you go during a certain rate of time. You know that without any equation. It’s just the basic definition that you probably already understand. That makes it pretty obvious: to find speed you need to know a distance and a time. If you increase the amount of time it takes to go the same distance, you’re lowering your speed. But… if you increase the distance then you’re lowering your speed. That’s might remind you of D divided by T.
When the top number increases it equals a lower number. When the bottom number increases it equals a higher number. This isn’t something you should need to memorize. It helps to recognize it but memorizing is unnecessary. Writing assignments are also process oriented. Facts can help you write a better assignment but you’re rarely quizzed on any particular information. Once you have the basics of grammar down, you’re most of the way through the memorization. Anyone that spends a reasonable amount of time reading will know enough to do okay anyway. Do the work for the classes. In many cases, that will be enough to score high. If your grade isn’t what you want it to be, focus on using and understanding the processes. Don’t focus on memorizing them better. Most of the time, this should feel completely natural. Most students don’t struggle with this decision. Memory oriented study material can be learned through memorization. Despite what you may feel, memorization is easy. Scientists have been studying memorization for decades. It’s literally down to a science. Use a little bit of spaced repetition and the information will stick. That’s why I recommend you look really hard for any good opportunity to milk memorization for points. Memory orientation often isn’t based on the subject. From my experience, science classes (not physics) often focus on a memory orientation. There is no logical way to derive the basic parts of a cell (or a frog brain or a muscle.) This is mostly a memory task. In some way, you’re just learning another language. History classes sometimes have a reputation for date and event memorization. I personally haven’t seen this but it would also fit into this category. When study material is memory oriented, there are many different approaches you can take to studying it. Use the linking method *this one is gold. It’s hard to “get” but it’s easy once you get it. Never turn a memorization task into an understanding task without a very good reason. Memory oriented information is easy. (Focus on the strategies discussed on this blog for a month and you’ll know exactly what I’m talking about.) Trying to understand stuff deeper and use processes can be super complicated. 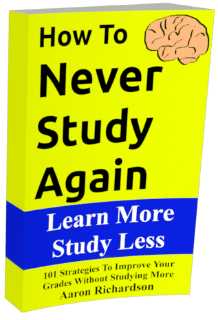 If you can get away with memorization then you can improve your grade with less stress. If there is an obvious pattern to the information you’re trying to learn (even if it’s only 95% accurate) then you can consider turning your memory task into a processing task. When explaining this, it seems like a minor difference but patterns can make a huge difference when multiplied over hundreds of instances. If you’re planning on doing something for years to come, it’s always better to get it through a process. Processes are slower but they give you more exposure to the information. They force you to roll the ideas around in your skull a few times. They’re powerful for that reason. A memorized list needs to be reinforced with spaced repetition or it will start to be forgotten. (Less so with a quality linking strategy.) A list that you understand the process behind will have many more links that will be much easier to figure out when you need it years later. This is a post that I plan on expanding on with more detail and examples in the future. Hopefully it will help you crush your studying in a more systematic (and easier) way. Thanks for being a subscriber. You make this all work. You’re the backbone of this site and we appreciate your support.